This week Cañon City High School welcomed the Class of 2022 to the building! While out and around the district this week, new Director of Special Services Tim Renn found time for a selfie with new Cañon City High School Assistant Principal Matt Barton and Link Crew Sponsor Extraordinaire Shane Thornton! Add to this the outstanding service our Nutrition Services team provided all summer ensuring one of the most basic needs of our children were met, food. A child can’t learn if they are not properly nourished. Thanks also to our entire staff for displaying a positive attitude about our desire to have folks on duty wear fluorescent orange vests to be more easily identified by parents and children when on duty. This both meets the social-emotional needs of our children outlined in our 1st core belief, allowing them to quickly identify who can offer assistance in time of need, as well as core belief number 4, showing we truly emphasize what is good for kids over the needs and comfort of adults. A fine example of our 3rd core belief in action this week was an ice-breaker activity Social-Emotional Learning Coordinator Jamie Murray led students through with Cañon City High School Health Teacher Sandra Miller. The activity required students to collaboratively problem solve while having one of their strengths taken away, that being sight. The was designed to help students reflect on how it feels to navigate life while not being able to use a major mode of learning, giving each an opportunity to develop and display their key traits related to agency, tenacity, innovation, agility, and civility. Thanks Jamie and Sandra! On a final note, and related to core belief number 2 stating learning growth matters most, I offer kudos to the staffs of Washington Elementary, Mountain View Core Knowledge Schools, and Cañon Exploratory School. CES experienced 61st percentile growth on the middle school language arts CMAS test, a result that will no doubt lead to an increased accreditation rating. Mountain View had a whopping 65th percentile growth on the same test at the same level. Meanwhile, the Washington staff achieved 56th percentile growth in elementary language arts and an incredible 80th percentile growth in elementary math. I have seen some amazing results at the elementary level in my career, but never as strong as Washington achieved this year! At the August 13th Board of Education meeting CCSD Summer Nutrition Services staff and volunteers were thanked for a job well done! The Cañon Exploratory School staff models their new duty vests. Once again, these are designed to make it easier for students and parents to identify who is in charge when kids are on recess, on walking field trips, and at lunch. 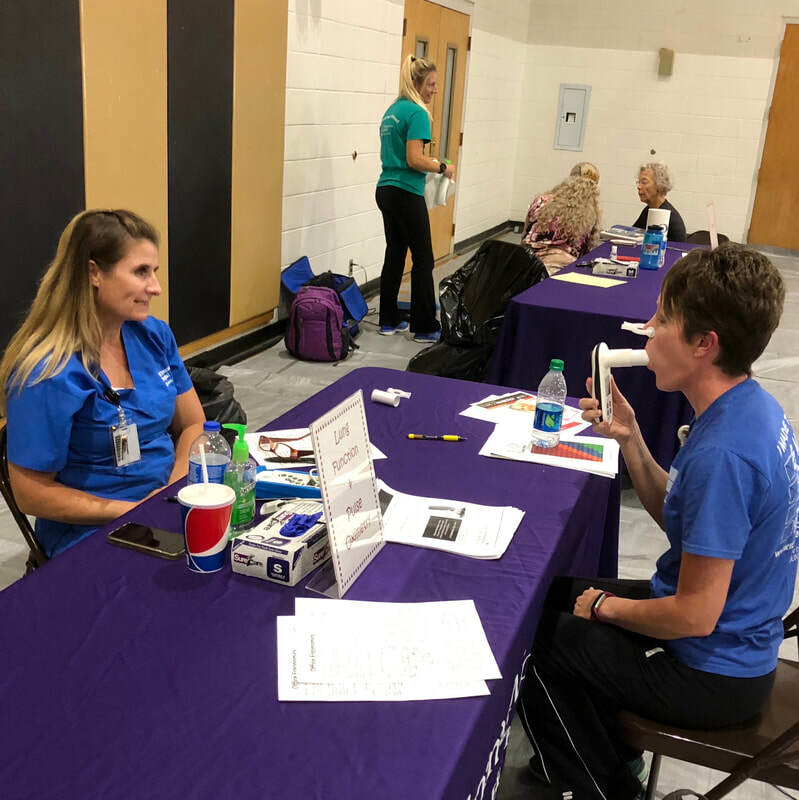 Last Tuesday Fremont Regional Wellness Coordinator Brian VanIwarden and Assistant Coordinator Toni Pierce held an outstanding Regional Wellness Fair for Fremont County school employees. 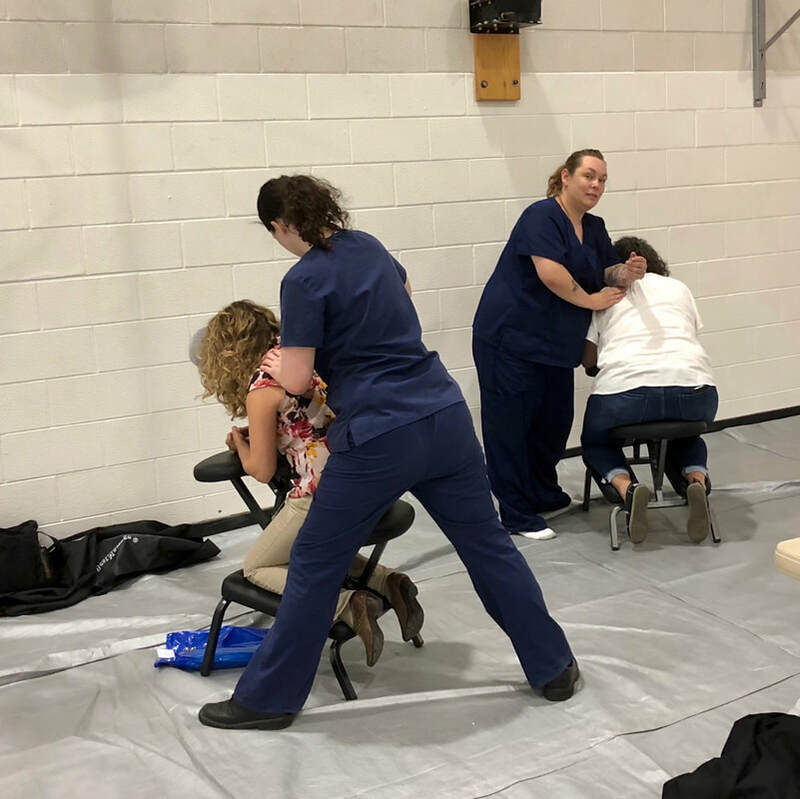 At the event, staff had the opportunity to experience acupuncture and massage therapy, test various personal health indicators, and receive counseling and support related to their individual health needs. This event fits right in with core belief number 1 “we put Maslow before Bloom” because in the field of education we are social-emotional all caretakers, and caretakers must first take care of themselves before they can support the needs of their students. Thanks to our many community partners for supporting this event, thanks to local businesses and organizations like Weigh and Win, RE-1 Nutritional Services, the St. Thomas More Hospital Wellness Team, Fremont Adventure Recreation (FAR), SOCO Ladies Ride Mountain Biking, Valley Wide Health Systems, Brews and Bikes, River Lotus Yoga, Life Counseling Services (ear acudetox), Salon De Cheveux, Royal Gorge Wellness, Absolute Relief Therapeutic Massage, and TELEDOC the event was a big hit and many participants walked away with outstanding door prizes. Technology Instruction Coordinator Dan Coppa helps two Cañon City High School students log in to their new Chromebooks. 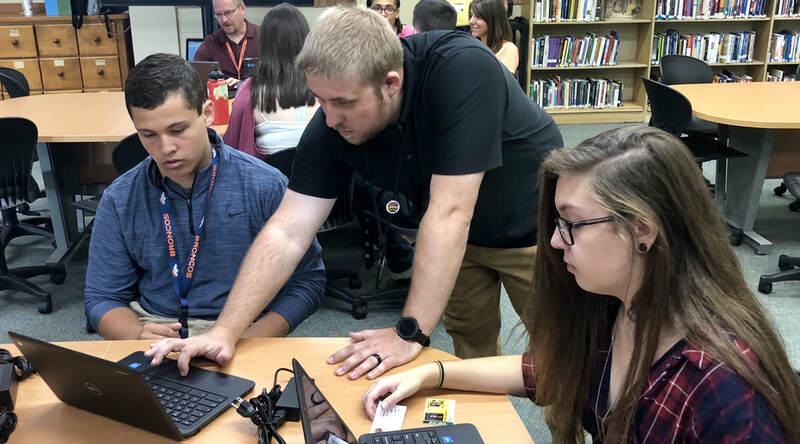 Director of Technology Shaun Kohl reports that despite ordering 50 more Chromebooks for the high school than we anticipated needing (the extra 50 were to be loaners for students to use while their assigned device is being serviced), we will likely be short a few machines when all have been checked out. We view this as a good development, as it would be a certain indicator we have more students at the high school this year than we anticipated. 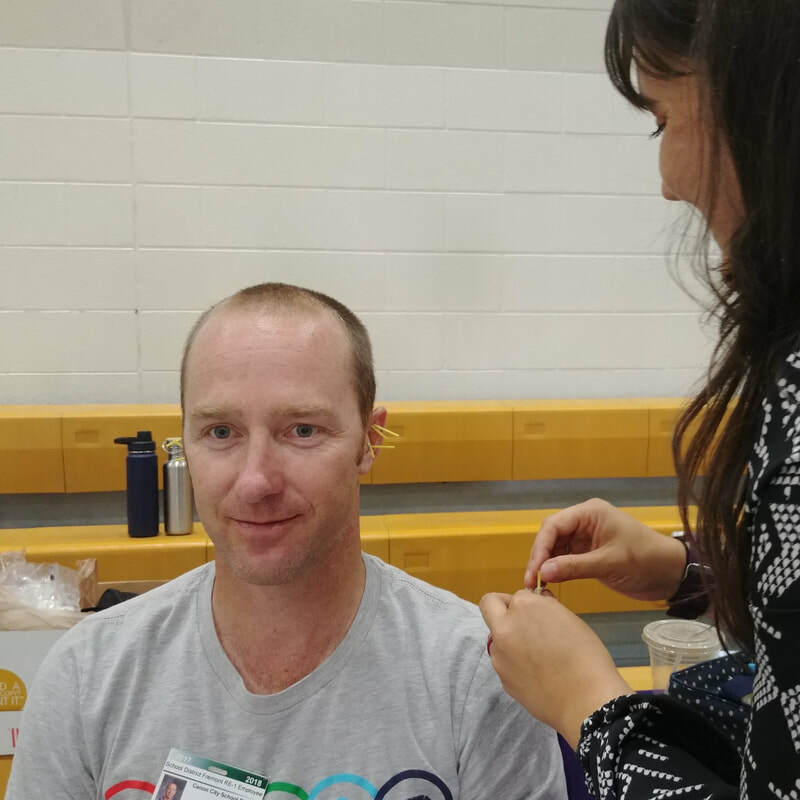 We’ve directed Mr. Kohl to make sure every grade 9-12 student gets issued a new device, and he is ready to make an additional purchase should the need arise. Our architect, Doug Abernathy, answers questions about our new Washington Elementary School project with members of the Cañon City Planning and Zoning Commission. Me, Jeff Peterson, and our primary architect Doug Abernathy attended a Cañon City Planning and Zoning Commission meeting on Tuesday evening night and our request to rezone the Washington Elementary property to allow for new school construction was approved with some non-binding recommendations. This means the matter will be placed before the City Council for final approval, and we'll continue to run property flow design ideas by the city planning department as we work to finalize our new site plan. Along the same lines, this Tuesday and Wednesday afternoon we’ll begin final design work on both our Cañon City Middle School major remodel and upgrade and our new Washington Elementary School facility. We expect this work to take in the neighborhood of eight weeks, and at each stage of this process we’ll be sure to invite key decision makers, including staff and community, to offer guidance. On one other Bond Progress front, we are currently in the process of approving a final design for our new grounds facility. Our biggest hurdle here has been dealing with escalating construction costs. However, we’ve made decisions that should allow us to leverage competitive bidding processes and contingency funds in a way that should allow us to get the most for our money. CCHS students learn how difficult it can be to collaborate while lacking one of their key senses. Monday was the first day of school for Mountain View Core Knowledge students. I enjoyed dropping in on their annual red carpet student welcome. I also have a series of routine meetings that day. On Tuesday we had our new classified staff orientation, a Superintendent’s Advisory Council meeting, and a Design Build team meeting focused on closing out summer construction projects. I also presented the weekly program at the Noon Lions Club, then stopped by our Employee Wellness Fair. Wednesday was the first day of school for all remaining grade K-9 students, except for CCMS 7th and 8th graders. On Tuesday evening I attended a planning and zoning meeting, and on Thursday I traveled to and from Denver for an Early Childhood Leadership Commission meeting. While there I had the pleasure of seeing Governor Hickenlooper announce a new grant program called Two Generation. Its focus is on supporting hopeful families. On Friday I started my day by surviving a first day ride to school with my 10th grade daughter Priscilla. She has her learners permit and I have committed to letting her drive us to school each day. She and all our 10th through 12th graders began school on Friday. I then spent the rest of the day working on a legislative advocacy resolution and a winter conference breakout presentation proposal related to our relationship with the Colorado Association of School Boards. I did each of these tasks while enjoying spending some time in commons areas at CCHS, McKinley, CES, Lincoln, and CCMS. My schedule for this week is actually a bit light so far. For a change, I don’t have a ton of have to attend meetings on my calendar. However, I have six long term projects I’ve been working on related to CASB, administrator evaluation, and building evaluations. We have a Superintendents Advisory Council meeting on Tuesday morning, and we also begin design work on CCMS on Tuesday and at Washington on Wednesday. I also have another round of interview of Pueblo Community College-Fremont Campus Dean candidates scheduled for Thursday and Friday. McKinley Elementary is embarking on a one-to-one device program this year. As I worked in my office preparing for the upcoming school year, I was contacted by a concerned citizen that lived near McKinley Elementary. This community member expressed their interest in our new technology deployment and the fees that accompany the project. I shared the exciting news that we were able to partner with our Parent Teacher Organization to purchase the devices a couple of years before Canon City Schools will be able to deploy devices to all children at the elementary level. He quickly questioned what happens if students and families are financially unable to afford the fee. I explained that we were willing to do our best to work with everyone and set up payment plans or work-study opportunities. I went on to add that we were fortunate to have a couple of community members provide funds for a small scholarship program, but that those funds were used within the first day of registration and we had a handful of students on the waitlist to receive help. The conversation then switched to an article that he read about teachers regularly spending their own money to support their instruction and the students in their classrooms. He asked if that was commonplace in our schools, and particularly at McKinley. With a heart full of pride I assured him that this has been the case my whole education career and that educators regularly spend their own money without blinking an eye, just so they can make an impact on the lives of their students. The conversation finished with the gentleman stating he was going to do some thinking and that he would get back to me. Within a few days, I was fortunate enough to meet this person face to face when he handed me a packet containing several smaller envelopes and a clear set of instructions. He explained he wanted to make a donation to our school to support our teachers and students. The only thing he asked in return was to remain anonymous and to ensure the money was used to help students. I thanked him for his generosity, shook his hand, and lead him out of the office. When I went through the package I realized that I was holding a magical envelope that was truly going to impact the lives of the entire McKinley Wildcat Family. The contents included enough funds to cover the technology fees for all the students on the waitlist and a crisp one hundred dollar bill for every teacher in the school to use for students. There was even an extra one hundred dollar bill designated for the for the music program because that content area was dear to him. We are incredibly thankful for the donation and the wonderful things we'll accomplish with it. It rarely happens to me, but I am simply unable to find the appropriate words to express my sincere gratitude to this community member who shared some magic through his generosity. Whoever you are, please know that everyone at McKinley Elementary says THANK YOU! Scott Morton-Principal at McKinley Elementary.
. . . and I thank each of you for listening once again!